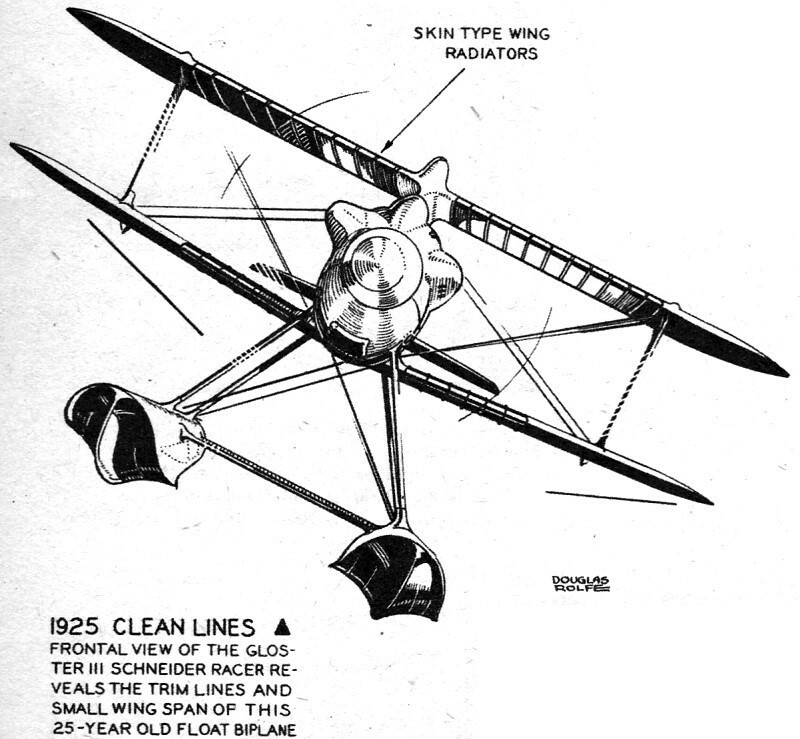 Douglas Rolphe ran a series of "Air Progress" and "Auto Progress" features similar to this one where he included line drawings and short factoids on each vehicle, with a timescale of sorts that shows progression in the state of the art. 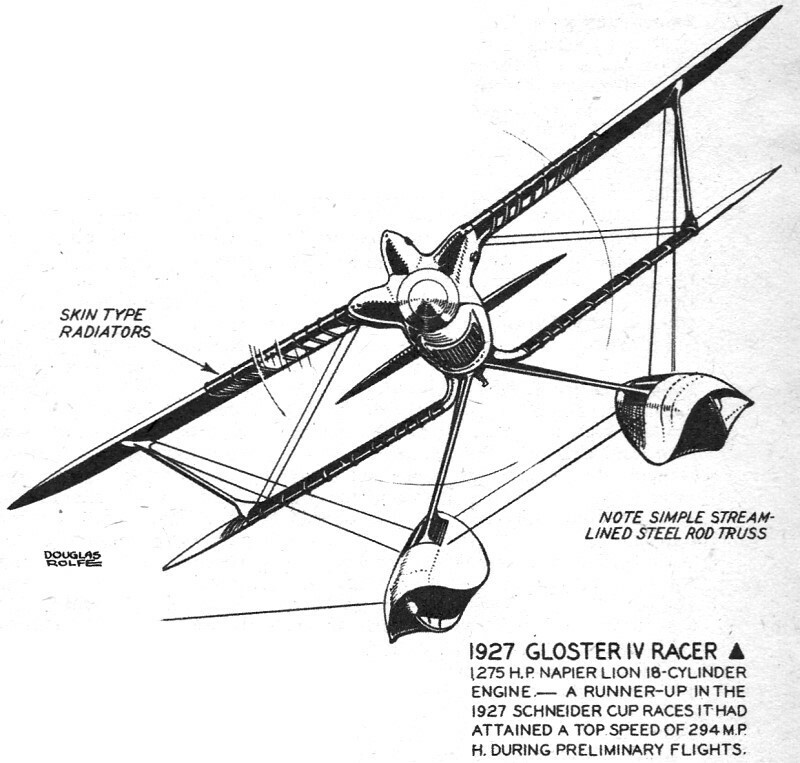 "The Search for Speed" has, as you might guess early model aircraft that were designed for racing and/or setting speed records. Many were one-of-a-kind and might make excellent subjects for scale builds in any of the competition categories - radio control, control line, free flight, or even static display. 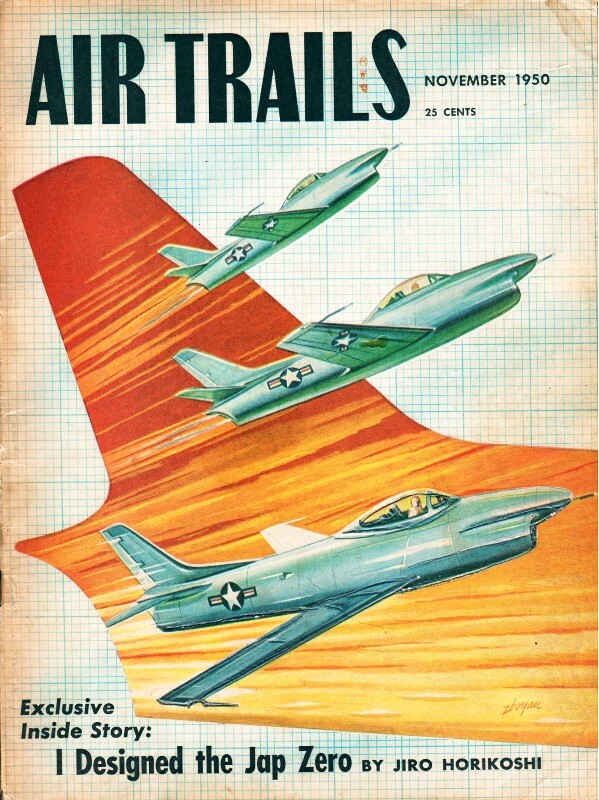 Presented on these pages we find a selection of racing planes which, despite the fact that each made an important contribution to Air Progress, have nevertheless passed into comparative if not complete oblivion. The best explanation for this state of affairs is that few if any of the designs shown here were winners in any major racing contest, though two at least established world's speed records in their day. All designs have been carefully chosen to illustrate the widely varying approach made by top-notch designers of the times to the same problem, i.e. ; speed. And a mere glance at- the names involved will show that most of these designs came from the drafting rooms and assembly plants of historically famous manufacturers many of whom are still just as well known today. The wide variation between actual speed and the horsepower used is another point of interest. 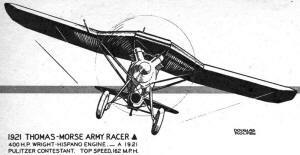 It will be observed that some of the lower-powered planes attained speeds far beyond, comparatively speaking, their higher-powered rivals. 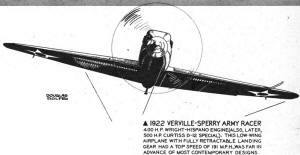 This situation is of course true today, when the design problem of producing a really fast piston-engine airplane is just as much a problem as it was to the men who brought forth the planes portrayed here. 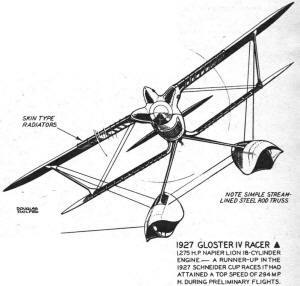 At least one of the firms represented, notably the Gloster Aircraft Co., is still making some of the world's fastest aircraft; this indicates the importance of racing plane development. 400 H.P. Wright-Hispano Engine. - A 1921 Pulitzer Contestant. Top Speed, 162 MPH. 300 H.P. Walter Engine. - This little Czech racer averaged 164-M.P.H. over a closed course. 1,250 H.P Packard 24-Cylinder X-type engine. In this ship Al Williams established a speed record (unofficial) of 322 M.P.H. Hispano-Suiza 18-cylinder engine. Built for the 1929 Schneider Tropy Contest but finished too late to participate in the actual race. - Est. speed, 400 M.P.H. 400 H.P. 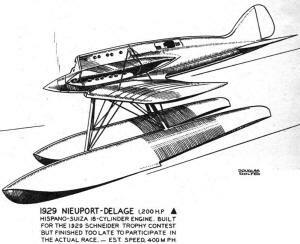 Wright-Hispano Engine (also, later, 500 H.P. 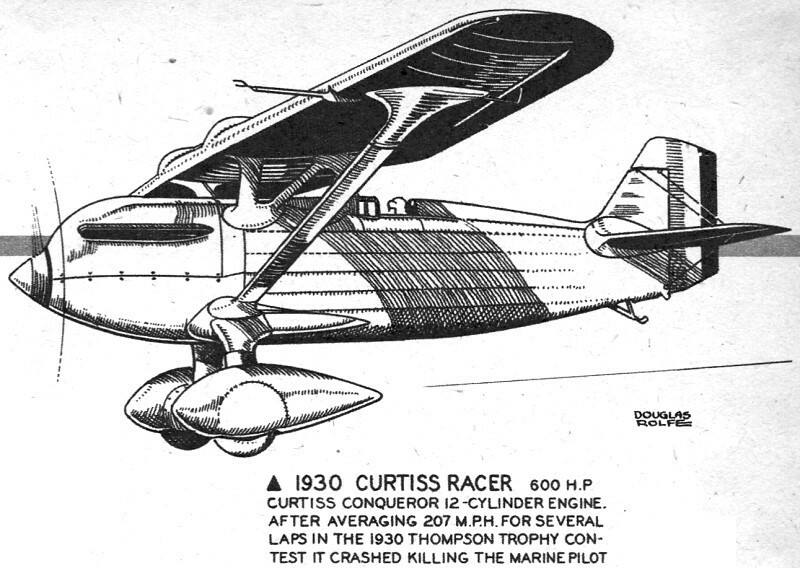 Curtiss D-12 Special). This low-wing airplane with fully retractable landing gear had a top speed of 191 M.P.H., was far in advance of most contemporary designs. 450 H.P. 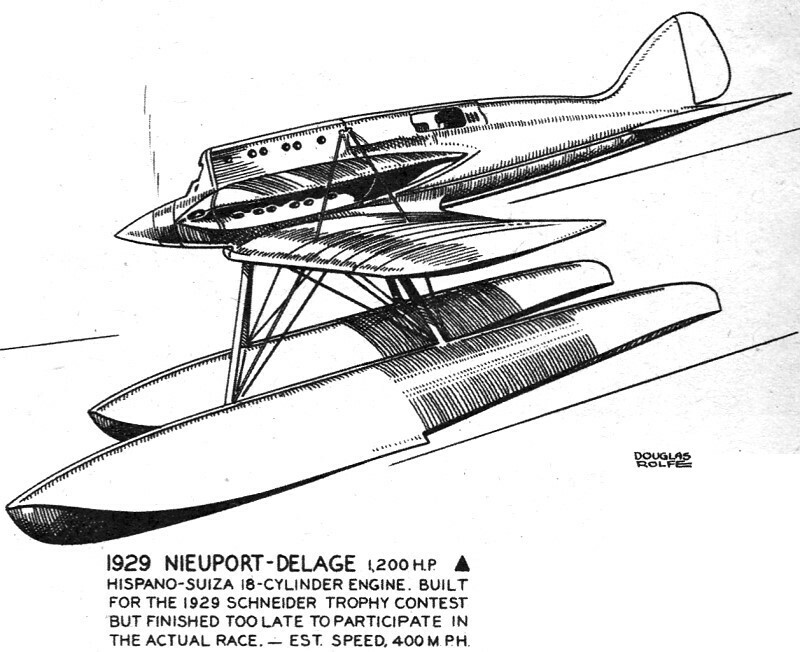 Hispano-Suiza 3-row engine. 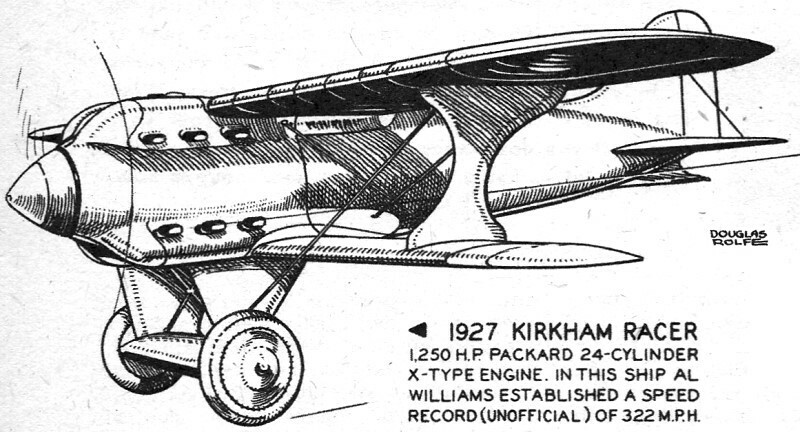 - In 1925 it set a world's record speed for landplanes when it topped 278 M.P.H. 1275 H.P. Napier 3-Row 18-cylinder engine. 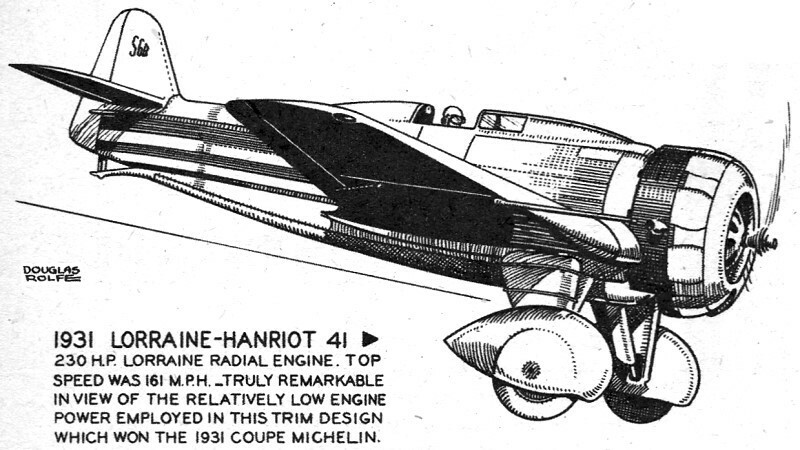 It placed second in the 1925 Schneider races with an average speed of 200 M.P.H. and in subsequent trials attained a speed of 234 M.P.H. 1275 H.P. Napier Lion 18-cylinder engine. - A Runner-up in the 1927 Schneider Cup Races it had attained a top speed of 294 M.P.. during preliminary flights. 230 HP. Lorraine radial engine. Top speed was 161 M.P.H. - Truly remarkable in view of the relatively low engine power employed in this trim design which won the 1931 Coupe Michelin.